This technology will be more disruptive to business and society than the Internet. It will fundamentally shake to the core business and governmental institutions that have been in place for millennium. And there is nothing they can do to stop it. 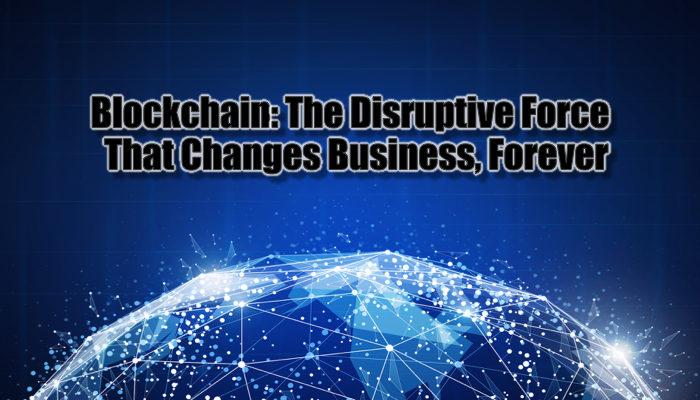 Every business that conducts transactions, records transactions, validates and verifies transactions, and guarantees transactions will be forever disrupted and dis-intermediated. This level of disruption creates massive opportunities for those who can see it and act, and massive disruption for those who resist the inevitable. I’m talking about blockchain based applications. Blockchain: a massively distributed ledger systems for recording and verifying contractual and transactional exchanges that is very low friction and cost, very expensive to defraud, and highly available. It substantially decreases risk, theft, loss, and fraud. Blockchained information has substantially better durability than “etched in stone.” Blockchain creates and validates trust. The Bitcoin and the cryptocurrency craze is just the very tip of the blockchain iceberg because these are nothing compared to what’s being developed and beginning to be rolled out. The value generation opportunity is enormous. Right now, when you take a credit card, the clearing company takes two to three percent. What if that dropped to two or three basis points? That’s a 100x decrease in costs. Blockchain can do that. Forty to fifty percent of that credit card fee is there to cover fraud. Blockchain eliminates the fraud. See the disruption? See the increase in value? See the decrease in transactional friction? My forecast five years out… blockchain will be the heart of commerce, the soul of government, and the keeper of Truth. If cheating has value, and the risk or cost of getting caught is low, there’s a 100% probability of someone cheating. Blockchain eliminates that cheating. We are blockchaining finance records, loans, stocks, bonds, insurance, academic degrees, employment history, resumes, information sources, reputation, licenses, deeds, wills, copyrights, patents, software, movies, music, games, computer security, emails, voicemails, currency, contracts, construction, collateral, real estate, cars, jewelry, relationships, credit scores, historical records, genealogy, warrantees, guarantees, government functions, trustee and notary functions, tax levies, tax payments; the list is endless. What is your strategy for incorporating blockchain into your business? What do you need to know to exploit this opportunity? 5) Create a timeline and milestones for your blockchain projects. Want to do all of this in two days? Join me for the Blockchain Executive Strategy Summit. I’m so convinced that blockchain is critical to my business and the business of my clients and friends that I’ve invited four industry experts to come together and explain blockchain, and brainstorm how to use this technology to create new business outcomes. We will be building strategic plans for each attendee based on their business and mission. If you’re interested, let’s have a conversation.